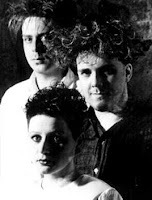 I'm fond of saying that no one sounded like Cocteau Twins before they did, and no one has sounded like them since. Of course that's an extreme statement; plenty have tried, but it's rare to find a track that captures Cocteau Twins' singular aesthetic and succeeds as a song in its own right. As a devoted Cocteau Twins fan, though, any discovery of other music that shares DNA with them is a treasure. I got excited about Delays' 'Wanderlust' back in 2003; Greg Gilbert's reedy falsetto definitely reminds one of Elizabeth Fraser, and the guitars shimmer in the dreamiest dream pop way. It could fit comfortably on Love's Easy Tears. 'Wanderlust' seems to be a case of convergent evolution, though; the rest of Faded Seaside Glamour, while lovely, uses other palettes. Then in 2005 I was blown away by Tegan Northwood's 'Close' from Self-Raising Flower. Musically it fits in the same Cocteau time period as 'Wanderlust', maybe on Blue Bell Knoll. The minimal synthesized percussion and processed strummed acoustic guitar are perfect, and Tegan's voice, facility with odd intervals and largely unintelligible elocution are a brilliant match. I think it's intentional, since she references Cocteau Twins in her profile, though the rest of her provocative experimental album pushes in other directions. Now I've found Annie Barker, though it seems Mountains And Tumult has been around for a year already. She actually got Robin Guthrie to produce the album for her, after a chance meeting. First track 'Kissed me' really got my hopes up because everything is right: the Victorialand-esque twangy guitar washes, the diminishing chord progressions, the restrained drum track. And Annie is doing her best to channel Elizabeth: mannerisms, alto/soprano toggling, harmonies and tone. It really works, and it's really lovely, but unfortunately the rest of the album never quite delivers on the promise of 'Kissed me'. It's foolish to attempt a cover of a Cocteau Twins song, unless you plan to rework it radically, but I can't help but admire artists who pay homage to them, knowingly or not. It's not fun if the homage falls a little flat, but on the rare occasions when it works, it's the next best thing to having new Cocteau material.